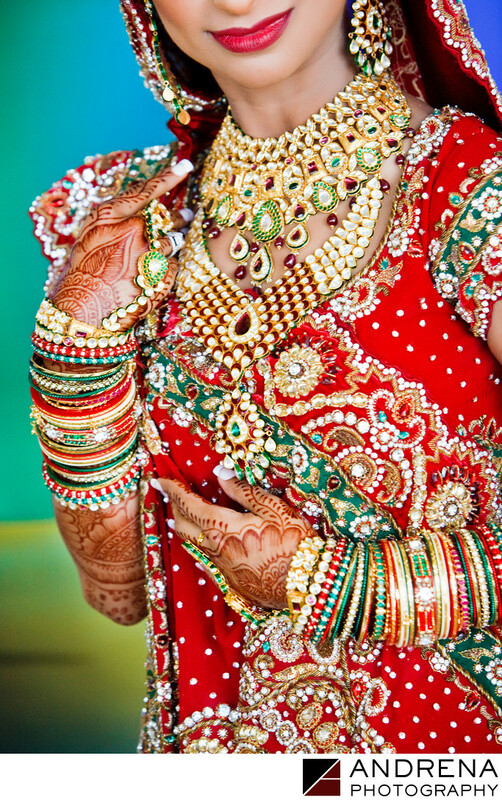 Cinal Bhindi is a member of the Bhindi Jewellers family, so I was delighted when she chose me to photograph her wedding because I couldn't wait to see what kind of bling she might wear. Cinal is so stylish, and she of course didn't disappoint. Her necklaces, earrings and bangles were stunning, as was her beautiful engagement ring. I love this photo of the jewelry detail, which I captured in front of a painting in the lobby of the Long Beach Hyatt. The beautiful turquoise and aquamarine colors in the painting provided a lovely backdrop to Cinal's red lengha and all her lovely jewelry. Florals were provided by Shawna Yamamoto, while coordination was provided by Jeannie Savage at Details Details. Indian wedding photographed at the Long Beach Hyatt in Long Beach, California.